Although the breast is a single (albeit paired) organ, it is the site of as many different tumors and tumorlike lesions as many complex organ systems. Adding to the diagnostic complexity is the array of cytopathologic and histopathologic breast specimens presented to the pathologist, each with its own radiographic correlations. Finally, new molecular and genetic data, and a plethora of markers and prognostic and predictive factors have been applied to the study of mammary lesions in recent years. In this superbly illustrated and referenced Fascicle, Dr. Tavassoli and Eusebi combine to present an amalgam of approaches and diagnostic clues distilled from their extensive experience on both sides of the Atlantic, and take us through the full range of normal anatomy, benign and malignant epithelial and nonepithelial lesions encountered in the breast, the latest in breast cancer staging, currently important and less useful prognostic and predictive indicators, and processing tips for the classical and newer types of specimens received by the pathologist. 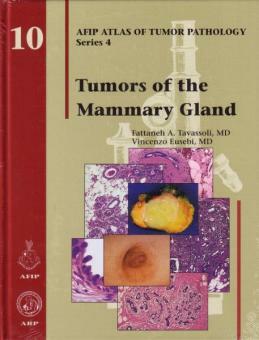 This volume will be an essential part of the pathologist’s library, and an important reference for any physician dealing with diseases of the breast, for years to come.